The Viking men were brave travellers, warriors and farmers, and they were often expected to be good at all three. Often first associated with the violent and bloody raids that took the Viking people to large parts of Europe, the Viking men in reality were first and foremost traders and farmers. While violence and conflict was a large part of Viking life, it was not everyday life, and this is the distinction between the idea of a Viking man and the reality. The common opinion of these barbaric men, raiding, pillaging and seeking only treasure is far from the whole truth. Farming and living off the land was the primary way to survive in Viking times, and every Viking man would have to learn this if he were to survive. More importantly if a Viking man was not seen as self sufficient then he was considered weak by the rest of his community, and Viking men prided themselves on their reputation. 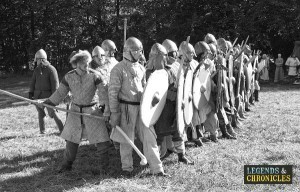 A group of Viking warriors readying for battle. Life for a Viking man as we mentioned much more complex than being a simple barbarian or warrior, although of course this was still important. Viking men grew up fighting, it was encouraged, and as children they would handle weapons, and work on the family farm or in the family trade. In this way fighting and handling themselves was a natural instinct, but was not their primary job. To be successful in old Norse times, a Viking man needed to have a skill or a trade. A way to either make wealth or to provide for him and his family. The Viking man had rather limited options when it came to his career, but certain skills were common in old Norse times, and every Viking man had to learn at least one. Farming was the most common option for a Viking man, to work the land and keep animals. Farming was a great choice as land was typically plentiful and the Scandinavian climate was suitable for not only crops but also animal farming. Trading was another option for a Viking man, bartering swapping goods, and even travelling to foreign lands to bring back much sought after treasures. Its likely that many farmers also traded some of their stock or goods. Metal working or wood working was also an option, both skills were needed on a daily basis in Viking life. Swords, shields, boats and many more items all needed crafting and would be a valuable trade to know. Most importantly a Viking man would have to know how to control a boat, to successfully navigate the coastal waters, rivers and fjords of Scandinavia. A Viking jarl addressing his king. Family life was not really an option for a Viking man, while some Viking men wouldn’t marry it was not common. Of course in old Norse times, your children would provide free labour on the farm or in the workshop. Your wife would help maintain your house, and ensure there was always food cooking over the fire. There were plenty advantages to family life in Norse times, and of course life expectancy was much shorter, providing more incentive to have children young. Sports and competition were an important part of life for a Viking man, and evidence has been found that many ancient civilisation like the Viking partook in these. Boar hunting is one sport that would likely have provide an escape from the farming life for a Viking man. Bows and arrows would be used and of course the spoils of the hunt would have provided a hearty meal also. In Norway archery was incredibly popular and the Vikings would have competed in archery competitions. 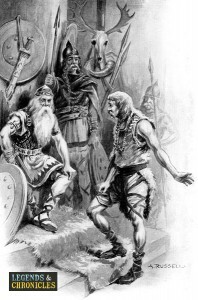 Other combat sports would have been common too, wrestling, sword fighting and other physical challenges would have allowed the Viking men to hone their fighting skills for future raids or battles. Life for a Viking man meant many things, to drink beer or ale, to be able to man a boat. He would also have to be self sufficient, able to provide for his family should he have one. Most importantly he would learn to fight from a young age, and would be adept and confident by the time he become a full grown man.